Michael Nobrega became Chair of the Board of Directors of the Ontario Centres of Excellence (OCE) in October 2012. He has been a member of the OCE Board since 2007. 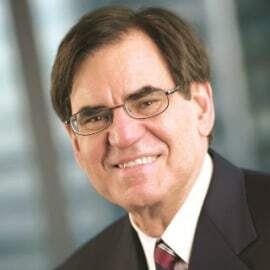 Mr. Nobrega recently retired as President and Chief Executive Officer of the Ontario Municipal Employees Retirement System (OMERS), a position he has held since early 2007. OMERS is one of Canada’s largest pension plans, with more than $50 billion in assets. It provides retirement benefits to 372,000 members on behalf of over 900 local government employers across Ontario. Mr. Nobrega is a veteran financial and investment executive with more than 30 years of experience. Before his appointment as President and CEO of OMERS, Mr. Nobrega was the President and Chief Executive Officer of Borealis Infrastructure Management Inc., an investment entity that originated and structured infrastructure investments. Prior to Borealis, Mr. Nobrega was a partner at a major international accounting firm. Mr. Nobrega holds an Honours BA from the University of Toronto, where he received the Arbor Award for outstanding community service. He also holds a chartered accountancy designation from the Institute of Chartered Accountants of Ontario and the Canadian Institute of Chartered Accountants. In 2009, Mr. Nobrega was named a Fellow of the Institute by the Institute of Chartered Accountants of Ontario – the highest designation the Institute confers and which recognizes outstanding career achievements as well as excellence in service to the community and the profession.